So, I am not only a person who loves gear, I have an OBSESSION with COMPRESSION! Last week, I let y’all know about the great knee sleeves I’m using from 110% Play Harder to aid in my injury recovery. This week, it’s only fitting I talk about the calve sleeves… AMAZINGNESS, utter AWESOMENESS, and I must say pretty NIFTY!! Yes, it comes it the bag to keep the ice sheets cold, the ice sheets, and the sleeves. To read more about that, check out my post on the knee sleeves . Can I just say how cool these things are?! First off, they are double layered but, I like it & they’re double layered so the ice sheets can stay securely in the ‘pouch’ & the ice not lay directly on your skin. The material is light and well, I’m wearing them outside on a 90+ degree south Louisiana day and I’m comfortable. So what I think is super nifty is that within the the front pouch, it tells you Front in red screening. 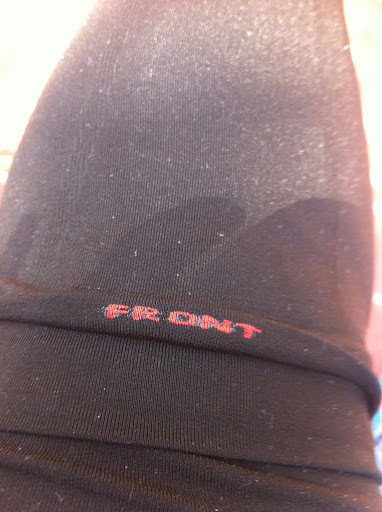 Most of the time with compression, especially first time users of calve sleeves, no one has a clue as to what side is what (and sometimes the advanced are clueless too & granted some don’t have sleeves designed to be front and back but universal)- so anyways, the writing on the sleeve makes it easy!! When I get compression sleeves (and I have about 4-5 pair of them) there is usually something going on that I’m not necessarily in love with… like pinching because of materials used, length, heaviness, or overall durability. These compression sleeves do not slip when they are on my calves, they stay put and the material used isn’t plasticy or harsh on the tops of your calves. They fit. For myself, the length is perfect! Not to short & not to long. It’s really love!! lol. Because of my knee injury, I have not been able to actually run in these outside but I have used them in pool running. I like what I’m getting from them. I’m not sure if I’d wear them running/biking in the summer outside in the south but definitely immediately following any workout… especially with the ice… ahhhhh it’ll be a little piece of heaven on earth! If you end up getting a pair, I’m sure you’ll be just as happy as I am with all of 110%s products!! 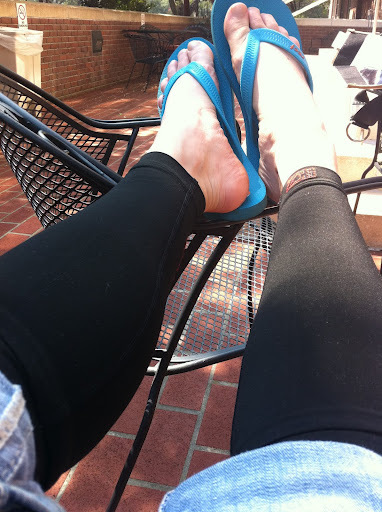 Okay – you have to help me out – what is the benefit of running with compression gear?? ?